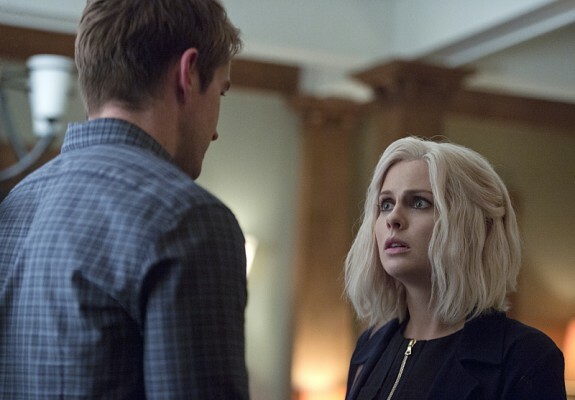 For the second week in a row, the procedural aspects of iZombie only serve to support the Liv (Rose McIver) / Major (Robert Buckley) relationship. Consuming a brain obsessed with sports allows Liv to not only make a work connection with Clive (Malcolm Goodwin), it enables her to connect Major to meaningful work again – helping kids – something that he lost in S1. In retrospect, this development was anticipated last episode when Major ran into one of the youths from his program when he was buying Utopia. The renewed sense of purpose (and the potential for a relationship with Liv) gives Major the strength to stand up to Gilda (Leanne Lapp) and lie about the zombie suspects she wants him to investigate, which is a step in the right direction. Max Rager: Unfortunately for Major, Max Rager has hit a brick wall in their zombie testing. The scene when the scientist asks Major a series of increasingly ridiculous questions about the man he murdered last episode proves that the company not only fails to understand how zombism works, but that they truly don’t view these people as people any longer. It is obvious that Gilda is aware that Major is lying to her about her list of candidates and her veggie-stabbing of Liv to collect a blood sample continues to lay the groundwork for a Liv vs Max Rager confrontation. The writers seem to be hinting that Liv will be the cognizant zombie that the energy drink company abducts to study, which would not be a wise move. <Sings The Cure>: In other testing news, Blaine (David Anders), true to his word, sends Don E (Bryce Hodgson) to Ravi (Rahul Kohli) with a sample of the tainted Utopia to build a new sample of the cure. Liv has an amusing about-face at the mention of the cure, dropping her analytical front in favour of fantasizing about a future with Major. Ravi has other plans: he insists on stringent testing before anyone touches the new “cure.” This proves to be an astute decision considering Gabriel (Yani Gellman), the recently turned zombie, instantly turns into a pock-marked corpse after he injects himself against Ravi’s advice. This leads to the most inappropriately hilarious scene of the episode as both Blaine and Ravi scramble to grab the remaining sample, using the lab as a kind of obstacle course before Ravi successfully destroys the bottle. All I can say is that it is a good thing that Blaine doesn’t carry a gun or some other weapon (which I find somewhat surprising). Liv pretending to access her “third eye” before consuming the night watchman’s brain is amusingly comical. Clive’s flirtatious relationship with newbie Dale Bozzio (Jessica Harmon) in the precinct continues in the background this week, notably when she does the usual mime-jokes on the other side of the Captain’s window while he’s being chewed out. The coda finds Clive being visited by Suzuki’s widow. Earlier he questioned her about the possibility that Suzuki killed himself and though she doesn’t confirm anything, she does drop a bombshell on Clive when she brings him a tupperware full of brain. Perhaps Clive will learn Seattle’s best kept secret sooner rather than later? Finally: while I applaud McIver’s continued dedication to the zombie make-up and wig, I must say that from the back that white do’ is starting to look increasing like a helmet. It never moves and it looks rock solid. A little distracting. Your turn: what did you think of Liv’s time as a coach? Is Major back on the road to redemption? Is Gilda going to make a move on Liv? Do the cases seem less integral to the series lately? Sound off below.